Featured in the winter 2007/2008 women's collection. 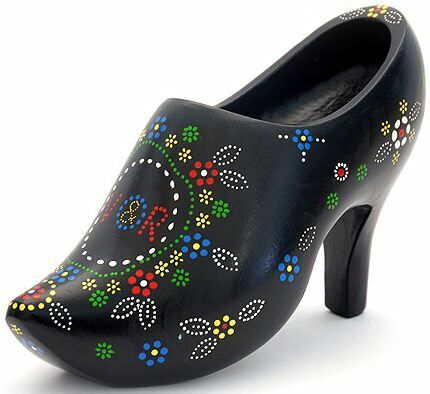 The high-heeled Staphorster clog is hand painted in an old traditional dotted craftwork pattern by an old lady from Staphorst. 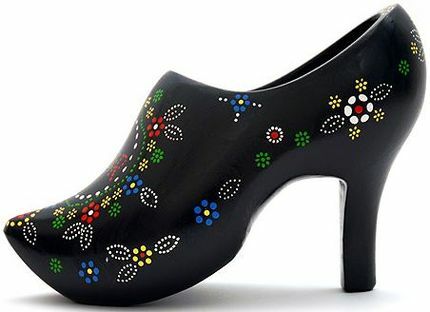 The wooden clog was manufactured by Jos Hogenkamp. 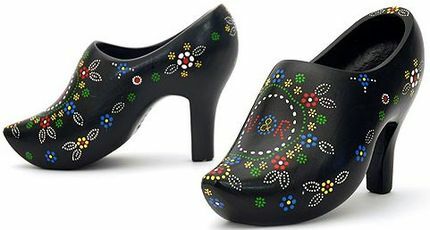 Staphorst is a municipality and a town in the eastern Netherlands, famous for people wearing traditional dress. Furthermore, it is one of the most religious towns in the Netherlands, with a lot of people attending Calvinist church. Staphorst is said to grind to a halt on Sundays. A large proportion of the population holds fundamentalist Christian beliefs and oppose technologies such as television and blood transfusions. This is in contrast to the permissive, libertarian tendency in Dutch law. Nevertheless, Staphorst has a big industrial area with small but modern enterprises; on days other than Sundays, tourists are welcome (Wikipedia).